(Photo: REUTERS / Samsul Said)A priest and altar boys walk down the aisle after prayers were conducted during a mass service inside the church of Our Lady of Lourdes at Klang, outside Kuala Lumpur January 12, 2014. The Sunday Mass at Our Lady of Lourdes Catholic church seems like a model for the multicultural, tolerant Malaysia that its government likes to present to the outside world. A long tussle over who can say "Allah" in Malaysia has flared anew, as Islamization that many see as driven by political forces threatens to erode the secular constitution and minority rights in the ethnically diverse country following a divisive election last year. Picture taken January 12, 2014. 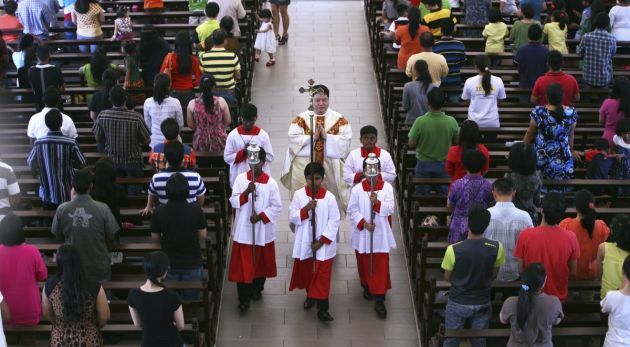 KUALA LUMPUR (Reuters) - The Sunday Mass at Our Lady of Lourdes Catholic church seems like a model for the multicultural, tolerant Malaysia that its government likes to present to the outside world. An ethnic Chinese priest conducts the service in the Malay language to a congregation made up of migrants from the country's eastern Borneo island states along with a handful of Vietnamese immigrants. But it takes only a few minutes for the worshippers to utter the Malay and Arabic word for God that has become a festering source of contention in the Muslim-majority country, deepening ethnic divisions and tarnishing its moderate image. "We believe in Allah, the father almighty, creator of heaven and earth," the 300 or so faithful chant. A long tussle over who can say "Allah" in Malaysia has flared anew, as Islamization that many see as driven by political forces threatens to erode the secular constitution and minority rights in the ethnically diverse country following a divisive election last year. A court ruling last October in favour of the government's case that Allah is exclusive to Muslims was followed this month by the seizure of more than 300 Malay-language Bibles by Islamic authorities using a little-known state law. Lawyers say the row now threatens to become a constitutional crisis as the federal charter's guarantee of religious freedom is challenged by more assertive enforcement of little-used state laws and decrees by Malaysia's royal sultans - who have the authority to appoint clerics and instruct religious police. The crisis appeared to deepen on Sunday when Malaysia's king, regarded as the defender of the Islamic faith, gave his backing to the October court ruling, the first time the largely ceremonial head of state has weighed in on the issue. Malaysian police have recommended prominent Catholic priest Lawrence Andrew be charged with sedition for saying churches would keep saying Allah in Selangor, Malaysia's most populous and richest state which neighbours the capital Kuala Lumpur. The tussle over the right to use the word is uniquely Malaysian, bemusing many religious scholars even in countries with a reputation for much stricter Islam. "When I go through Facebook you can see people are saying Malaysia is being such a funny country, we have become the laughter of the world," said Richenda Raphael, a 25-year-old worshipper at the Catholic Mass. "In Saudi Arabia all people can use the Allah word, but here we can't. We should stop this," said Raphael, who moved to Kuala Lumpur from the Borneo state of Sabah five years ago. The latest bout of tension, and confusion, over the word was triggered by a court ruling in October that Andrew's Catholic newspaper could not use Allah because it was not "an integral part of the faith in Christianity." A federal court will hear an appeal by the Catholic Church in March. Government ministers have said the word could still be used in eastern Sabah and Sarawak states, where most of Malaysia's Christians live, but the ruling has left doubt over whether it can be used in the peninsula, to where many Christians have migrated. Christians make up about 9 percent of Malaysia's 29 million people. The unprecedented raid to confiscate Bibles this month was based on a 1988 state law in Selangor that restricts more than 30 Arabic words and phrases to Muslims. Those who support Muslims' exclusive right to the word have justified it by saying that its use by Christians could confuse Muslims and be used to convert them to Christianity. At one of a series of public events to defend the ban in Selangor state, Islamic and ruling party officials said Andrew had inflamed the issue and flouted state law with his comment that Christians would keep saying Allah. An effigy of the priest was reportedly burned at a recent protest by Muslims. "It is part and parcel of the uniqueness of Malaysia," said Hamidzun Khairuddin, a 47-year-old Muslim resident who came to watch the sparsely attended event by the side of a football field. "Everybody has to respect other religions." A large number of Islamic scholars say Allah is not exclusive to Muslims. Many have noted that Allah is not a name, with a literal meaning in Arabic of "the God". The term predates the founding of Islam and the Quran does not prohibit other religions from using it. Critics say Prime Minister Najib Razak's government, which is under pressure over a jump in living costs as it cuts fuel and food subsidies, has given confusing signals on the issue and at worst encouraged conservative Islamist elements within the long-ruling United Malays National Organisation (UMNO). The government has tilted away from liberal reforms and catered more to UMNO and Islamic traditionalists since last May's unconvincing election win, in which ethnic Chinese voters and many urban Malays deserted the long-ruling coalition. While promoting his anti-extremist Global Movement of Moderates on foreign trips, at home Najib has allowed senior party members and ministers to sharply raise their rhetoric against perceived threats to mainstream Islam. The interior ministry this month banned a prominent civil society group, partly because some of its members were deemed un-Islamic. "They have totally abdicated their responsibility to provide leadership at a time of crisis," said Andrew Khoo, co-chairman of the Malaysian Bar Council's Human Rights Committee. "Malaysia's international reputation must be suffering as a result of this." Najib - whose cabinet endorsed a 10-point plan in 2011 that allowed the importation and publication of Bibles in Malay - has not mentioned that agreement, calling for the dispute to be settled using "the rule of law and dialogue as well as mutual respect." The plan was announced after arsonists firebombed several churches in 2010 over an initial ruling that allowed the Catholic newspaper to use the Arabic word. The three-party opposition has also not made a united condemnation of the Jan. 2 seizure of Bibles from a Christian group. That reflects the political risks of appearing not to defend Islam. A survey by the University of Malaya found that 77 percent of Malays, who are Muslim and make up about 60 percent of the population, felt Allah should not be used by other religions. "It's a collective failure of the whole system of maintaining balance and good sense between the different races and religious groups," said Ahmad Fauzi Abdul Hamid, associate professor of political science at Universiti Sains Malaysia. That has left Christian worshippers in Selangor and other states in limbo over what they see as an integral part of their faith. The worshippers at Our Lady of Lourdes church said the word had been second nature to them and their only way to refer to God since their childhoods in Borneo. "I don't like the Malaysian system where politics is mixed with the religious because these are two different things and very sensitive," said Frendie Aloysius, a 29-year-old customs officer, after attending Mass.